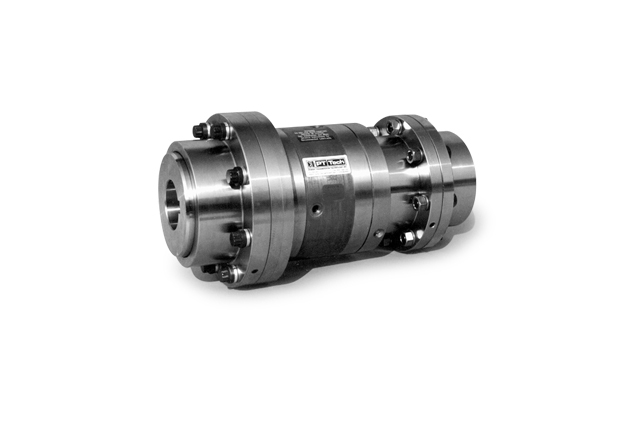 Series 600 Coupling is intended for use in adverse conditions. In addition, it utilizes centrifugal throw-out (C/T) sprags to extend life. It can only be used in applications where the over-running speed is significantly higher than the drive speed. The clutch is oil lubricated and is suitable for operation in temperatures down to -40° F.
Dimensions subject to change. Use certified prints for design purposes. The quality, dependability, and performance of spragtype over-running clutches and gear couplings have made them standards for heavy industry. PT Tech combines these two proven products into a unique clutch coupling package...the SGK Over-running Clutch Coupling. The SGK product line is distinguished by its dropout center section. Removing the gear coupling bolts allows the clutch center section to be dropped out without disturbing the driver or driven unit. This provides for ease of service or rebuild. By combining sprag-type over-running clutches to gear couplings, the result is the best combination of torque capability to bore capacity of any over-running clutch coupling because the unit does not have to be oversized to accommodate the bore requirements. Large Coupling Bores Sprag clutches are severely limited in bore capacity. By placing the sprag clutch on a high strength shaft in the spacer of the coupling, the clutch bore is no longer limiting. Thus, the SGK Clutch Coupling is selected on torque, not bore considerations, and is normally more economical than conventional over-running clutch couplings. Superior Misalignment The standard SGK Clutch Coupling is capable of up to 1-1/2º angular misalignment per gear half. The long distance between gear coupling halves ensures excellent offset (parallel) misalignment. For high misalignment conditions, spindle-type gear couplings are available to extend misalignment capabilities to 6º per gear half. Easy to Install and Service As simple to install as a gear coupling. The clutch is assembled in the center spacer part of the coupling. The clutch-spacer assembly acts as a drop-out section and can be installed / removed without disturbing driver or driven shafts. Low Maintenance The SGK 400 and 600 Series clutches are oil-lubricated with 200% greater lube capacity than the standard sprag clutch by virtue of the oil reservoir. Long Life With proper maintenance, the Series 400 will provide many years of trouble free operation. For applications where the over-running speed is significantly higher than the drive speed (such as inching drives, creeper drives, turning-gear drives, etc.) the SGK Series 600 clutch couplings can be used. Centrifugal throwout sprags are balanced to completely lift off the race above the drive speed resulting in unlimited sprag life. Taconite-Type Seals The Series 400 and Series 600 Clutch Couplings are equipped with a very effective taconite-type seal to protect the oil seal. This seal is regreasable to purge abrasive contaminants from the oil seal area. The taconite-type seal includes a "V" ring face seal to allow for longer periods between seal regreasing.